FEW FASHION ARCHETYPES MEASURE up as having the symbolic power that the ‘business suit’ has. The ‘little black dress’ perhaps, or the quintessential denim jeans, but neither of these come with the highly-charged connotations that the business suit confronts us with. The suit is both a symbol of power and professionalism in corporate culture, but also of monotony and complacency, which in turn hints at the potential for human frailty. 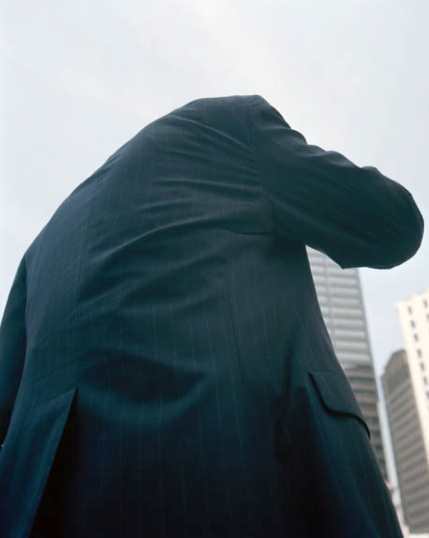 In his series ‘Executive Model’ Ron Jude photographed the corporate world of the American businessman, documenting the exclusivity of this culture. 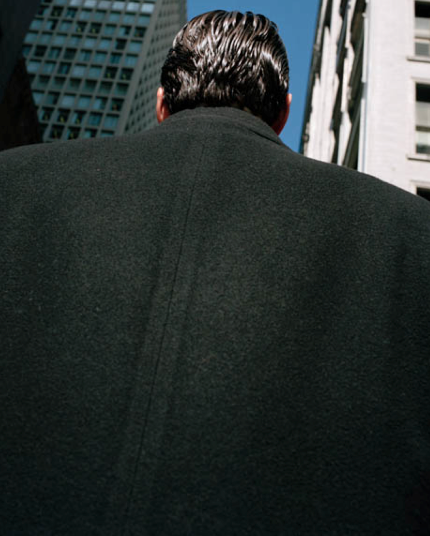 Photographed between 1992 and 1995, across various US cities, the series is part street photography, showing frames of the anonymous suit-clad backs of office workers, cropped so that the form of the suit dominates the frame. Flashes of sky and the looming office towers hover in the background of these cityscapes. 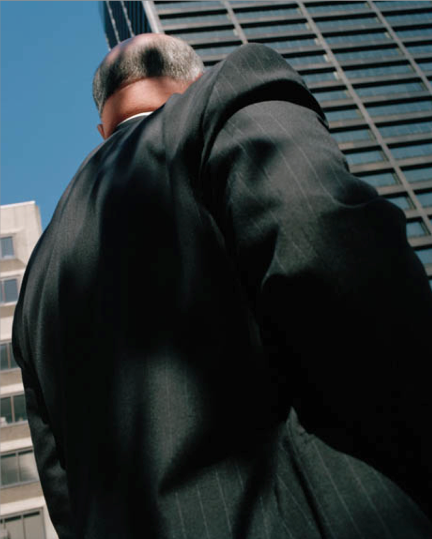 In Jude’s photographs the suit bears down on us like a skyscraper, and we see both in the same realm, giving the suits the same weight and monumental presence as the glazed towers that surround them. 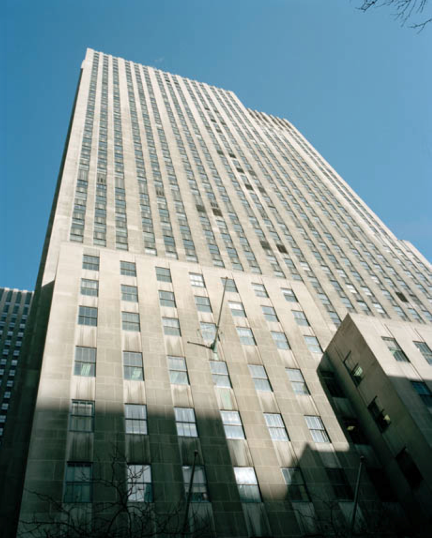 These images look at corporate culture from the outside, as a closed-off world with its own language and customs, inaccessible although very much within arm’s reach and omnipresent to those on the outside of it. 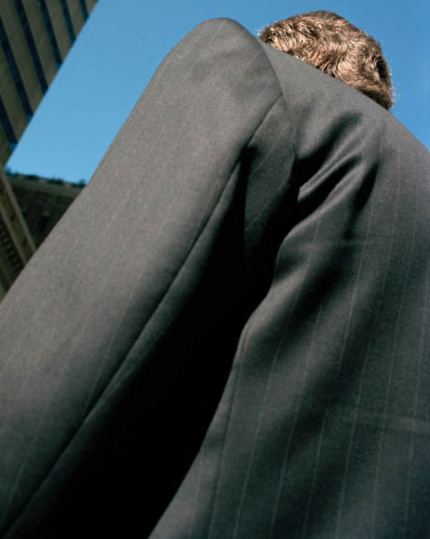 The awkward details – such as the crumples of the suit – are intimately in focus but exclude the viewer. When interviewed, Jude describes the context for the work as such, ‘I was living pretty poorly and the world of money seemed out of reach. I had every advantage one could possibly have – I was an educated white guy living in America – and yet, as someone who was raised in a rural, working class environment, these guys who were driving the economy and reaping the rewards seemed utterly foreign to me.’1 The corporate world is a clearly defined realm that does, as we see in Jude’s photographs, seem like a foreign culture to those on the exterior, but where economic and political decisions are made that presumably have a profound impact on the way we live. The photographs also show the awkwardness and frailty of the bodies within the suits, defying the perfect model of the slick lines of the suit. 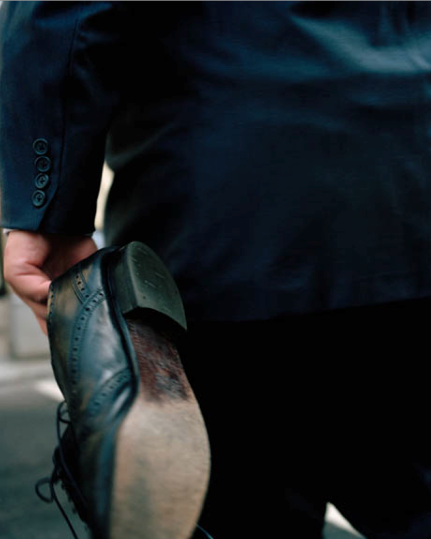 In one image, the vent of the suited back flicks up awkwardly; in another the figure mysteriously carries a shoe. In the formal qualities of the business suit, human individuality emerges, for, as philosopher Roland Barthes puts it, ‘The language in the garment system is made: i) by the opposition of pieces, parts of garments and details, the variations which entail a change in meaning. ii) By rules which govern the association of the pieces among themselves… of individual ways of wearing, size of garment, degree of cleanliness or wear, personal quirks, free association of pieces, etc.’2 So in deferring from the preserved, pressed and perfect business suit, the opposition of the archetype is revealed, when the suit is imperfect, there is an implication of weakness and of the individual body within. 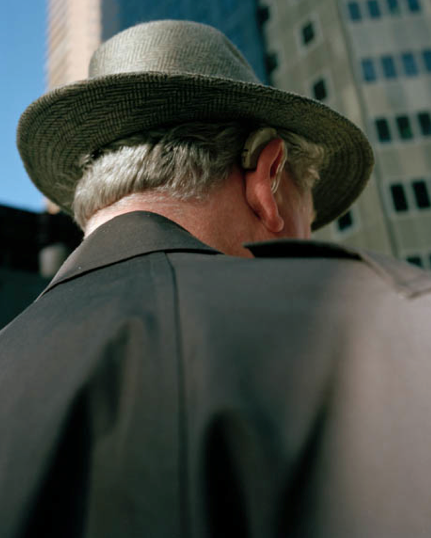 What these photographs capture so strongly is the clearly defined corporate world; a culture that, certainly from the outside, is a foreign phenomenon. 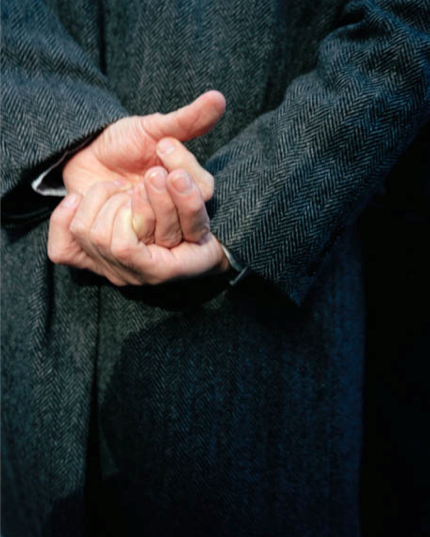 The suit embodies this exclusivity with sartorial formality, and Jude’s images focus intimately on the awkward detail to reveal the individual with this formal framework, despite the lack of recognisable human faces in the images. Images excerpted from the series ‘Executive Model’ (1992-1995) by Ron Jude, the series appeared in the book Executive Model published by Libraryman Press, 2012. I began injecting testosterone at thirty. When I slipped on the jacket in front of the mall mirror at thirty-two, I beamed. Tattooed, with a little hard-won stubble, I could see my contrasts cleanly, my aesthetics an armour telegraphing a history beyond words. A prison for some men was, for me, a church: the rare and precise glory of an integrated self. The word ‘collar’ presents a sort of curt simplicity that seems to fit its form and function as an object of dress. Thought to originate around 1300, the term originates from the old French ‘coler’, referring to the neck, which formed from the Latin term ‘collum’ having a similar meaning.